I'm back baby. The Emperor has returned to re-claim his empire known as the STOB blog. Before I give you a piece of my mind, the Romester has to pay homage to one of my idols that has shaped my awesome self. Today, I give honor to the man with several awesome nicknames. Some call him the"Viper" while others call him the "Legend Killer." I refer to him as "RKO". The Romester's hero that gets a shout out today is none other than Randy Orton. Just saw your documentary on Netflix the other night my friend and I must say, you are the coolest, baddest BA in the WWE. Randy, thank you for inspiring me to be the coolest and baddest blogger in STOB history. Alright, enough tipping the cap to another Rome Wall of Greatness inductee. As many of you all know, Minnesota collegiate and pro sports has sunk to an all time low. The Vikings are a good 2-3 years from talking about being a .500 club, the T-Wolves are calling it quits, Gopher B ball and Football are coming off disappointing seasons, the Twins are the worst of them all, and Chuck Fletcher has created one giant mess with the Wild. Well my fellow North Star State residents and sport supporters, I'm asking you all to pick a team and take a leap of faith on them because we will be laughing about these dark times in just a few years. I made the ultimate commitment over the weekend on one team to pull MN out of this hole. Story time starts now...so Paul Rome was with a couple of his buddies (two of the million) as they made their trek through breezy temps and cold winds to "The Bank" to watch the Gopher football spring game. Being a diehard Gopher nut, Rome wanted to see if M. Gray has made strides since last season and he wanted to see P. Nelson air it out. Though the wideouts dropped several passes and the freshmen QBs Leidner and Nelson were 0 for whatever, Paul Rome was basking in the glow in the most beautiful stadium he's ever been to. After watching the first 40 minutes of the scrimmage, the Rome entourage made its way to Gate E to inquire about season tickets. We got some info, thought about it, and at that moment, decided to pass as we made our way to the Goldy's Locker Room apparel store in the Bank. That's when Rome heard the heavenly sound of a voice singing in his head. It sounded something like this..."Give Me Something To Believe In. Give Me Something to Believe In." Rome drew inspiration from this classic Poison tune and amped up his sales pitch to his buddies, who were on the fence about committing full boar to Gopher football. Friend A and Friend B soon followed suit and we scurried our way up the steps to sign our names up for Gopher Football season tickets. Had it not been for the great Bret Michaels reaching out to the Romester, the dream of purchasing Gopher season tickets may have never happened. Heck, we almost made one of those cliche movie "pacts" before we purchased the season tickets...the pact that we almost made was we'd go to the bowl game if Goldy made it, wherever it was. Well, we stopped short of that once we saw the Motor City Bowl in Detroit was a Big Ten Bowl this winter and was the day after Xmas. Yeah, we aren't doing that. Guaranteed. Anyways, the moral of this story is we all need something to believe in MN sports fans. Why I picked Gopher Football over all the other teams is a question you might ask? Here are my answers for you friends. 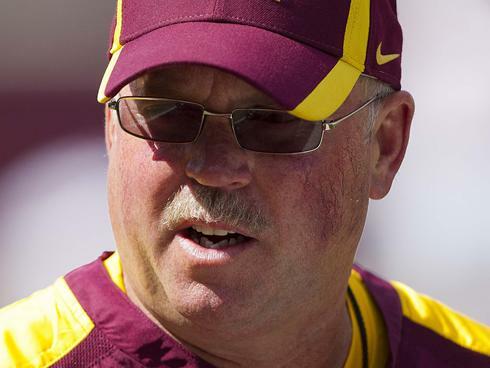 #1- I believe 100% in Jerry Kill. He doesn't put up with any garbage, is all about hard work, and defines a true Minnesotan... hard-working, honest and nice. I realize he's from Kansas, but he might as well be one of us. That's who we are people and I'm proud of that. Plus. that halftime adjustment against USC was a thing of beauty. Matt Barkley and Robert Woods had a field day in half one and in half two, it was completely different story. Kill stole the Iowa game with the brilliant surprise onside kick call and the tight loss to a really good Michigan State on the road showed these guys are ready to take the next step. Sure, they had some bad losses last year, but when you have new O and D schemes and players not brought here to play those schemes, you're at a huge disadvantage. It might not be this year, but we finally have a coach who knows what he's doing. Jerry, I believe, I believe in you. #3-Gopher football has the cheapest season tickets of them all so Rome liked that too. #4-Tailgating and Dinkytown. Lots of fun. The atmosphere of college football is second to none in sports. Enough said. I can already here the Rouser as M. Gray scoots in on a 3-yard option run in the last minute as we shock Michigan and take back the jug. Then its on to Sally's and The Library to celebrate some more. You can't beat that. Sure, the logical pick would be Gopher Bball to pull us out of the dumps and I love Tubby Smith and all he's done for that team (Sweet 16 anyone? ), but that's the easy, safe pick. Go on and take the "plunge," the "leap of faith," or whatever metaphor you choose. Pick a sleeper, an underdog, or the proverbial long shot. All MN teams probably fit into one of those categories. I just ask that you don't turn your back on that one team when the going gets tough. I took the plunge on Jerry Kill and Gopher football. I can promise you one thing, win or lose, its gonna be a lot of fun. So get out there MN and support your teams, no matter how bad they are right now. Better days are ahead friends, you just gotta believe. I'm Paul Rome and I am out!!! I’ll right away clutch your rss as I can't to find your e-mail subscription link or newsletter service. Do you've any? Please allow me recognise so that I may subscribe. Thanks.